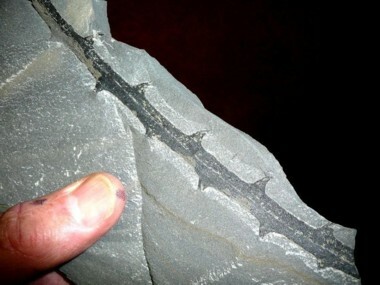 Early in 2007 John Mackay found some fossil thorn-like structures in cliff fall debris at Point Aconi, Nova Scotia, Canada. 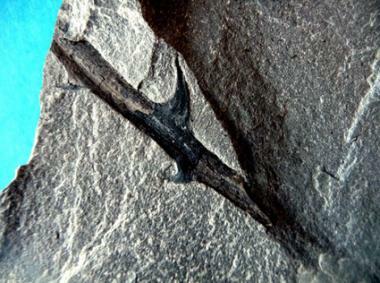 In September 2009 John Mackay and Stuart Macleod returned to the site and found this fossil. The fossils are in a layer of Carboniferous rocks. 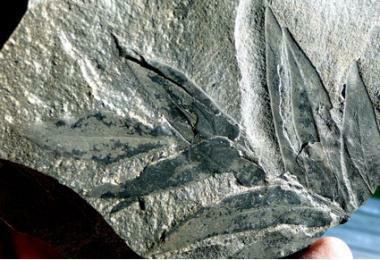 These beautifully preserved leaves indicate the fossils were buried rapidly and deeply. The sharp edges of the leaves show that worms and bacteria had no time to eat the leaves or cause them to rot before they were fossilised. 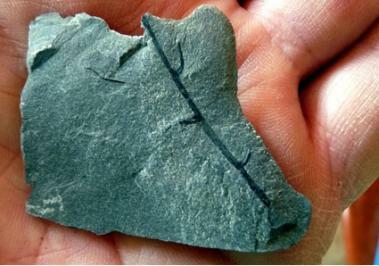 This tiny fragile horsetail rush is well preserved and is further evidence that the fossils were buried very quickly. 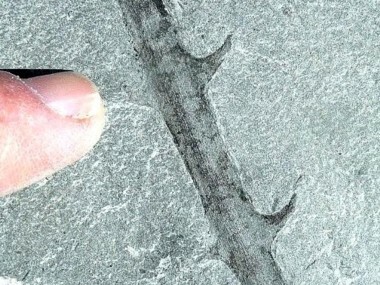 Since then we have had lots of thorny questions about the fossils, particularly since the book of Genesis has a very specific teaching on the origin of thorns that is totally contrary to the evolutionist view. First, let's consider what thorns and related structures really are. Many plants have sharp spiky outgrowths commonly called thorns. Botanists classify them as thorns, spines or prickles depending on how they are formed as the plant grows. 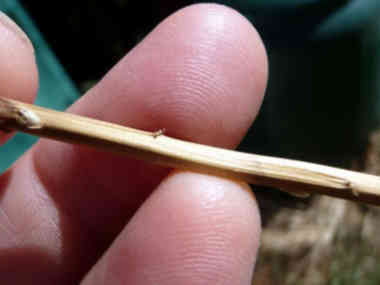 Thorns occur when branches fail to develop fully, and the partly formed bases form a hard woody projection. 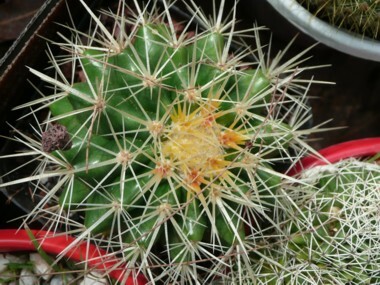 Spines, such as those on cacti, are leaf bases that have failed to grow into leaves or are left over when leaves fall off. 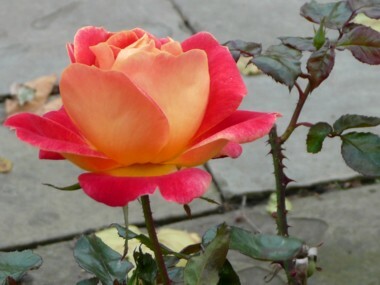 Despite the fact the sharp points on rose stems are known by everyone as thorns, rose thorns are technically labelled as prickles. They are formed by dense overgrowths of the outer layer of tissue on the stem. You can tell the difference between prickles and thorns if you try to peel them off the stem. Prickles can be peeled off, or will come off with the outer layer if the stem dies. 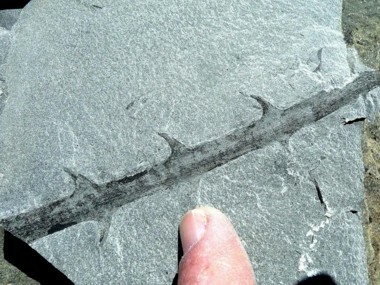 The fossil thorns we found were large, sharp and well preserved. 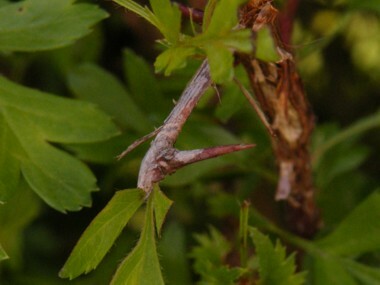 The largest were several times the size of modern rose thorns. 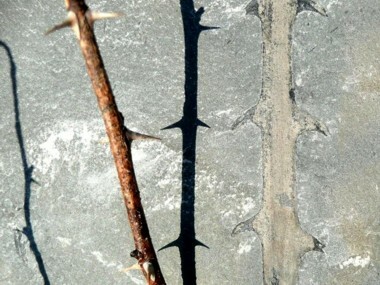 The presence of a black coalified layer around the branch and the thorns indicates these thorns were woody and they would have done a lot of damage if you fell on them. These small thorny stems indicate the mode of formation of mature thorns. These ones seem to be the reduced bases of branches. 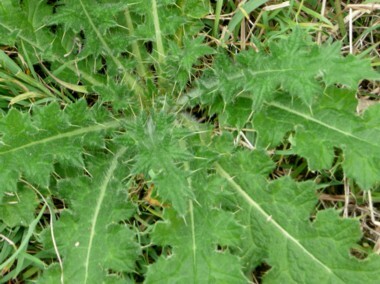 This method of thorn formation is common in plants today and is an example of plant degeneration. Whichever type of plant growth process formed our fossil thorns, no one would have wanted to fall on them or have them dragged over their skin due to the pain it would inflict and the resulting deep narrow wounds which could become a source of infection. A well preserved leaf from a seed fern named Neuropteris is one clue as to which plant the thorns may have came from, but we have yet to find a branch with thorns and leaves attached, either in our fossil collection or in a museum collection. 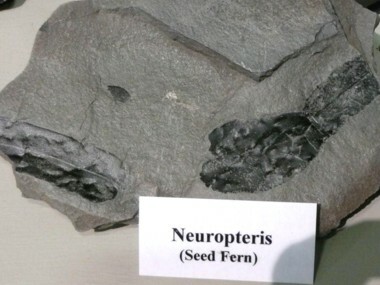 This is a Neuropteris leaf in a museum display. Neruopteris is an extinct plant of the Seed Fern family, but most plants with thorns today have both seeds and flowers. 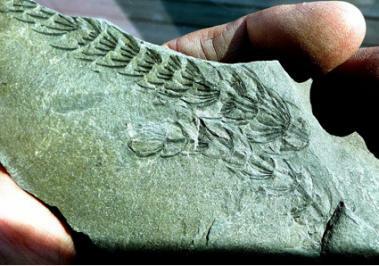 Flowering plants were not supposed to have evolved when the carboniferous rock layers in Nova Scotia were laid down. If our new fossils were thorns, such as those on hawthorns, cacti or roses, it would really blow a hole in most evolutionary theories. 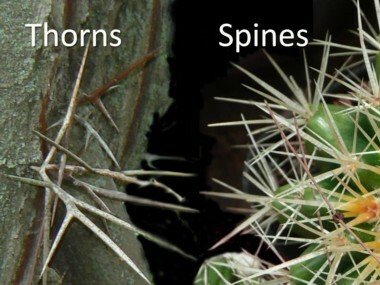 Thorns, spines and prickles are claimed to have evolved when previously non-spiky plants modified some of their stems to form thorns or their leaves to form spines, or they developed regions of extra growth in the outer layers to form prickles. This happened due to selection pressure from herbivores, i.e. spiky plants were less likely to be eaten by animals and would therefore live longer and reproduce. Genesis 3:17-20 tells us that thorns and thistles (a Biblical description which covers any sharp protuberances on plants that will do you damage, whether they be cactus spines, rose thorns, brambles or scotch thistles) are penalty for man's rebellion against God. Plants were not originally created with dangerous thorns, spines or prickles. In the beginning everything God had made was "very good" (Genesis 1:31) and plants would not have been harmful in any way. 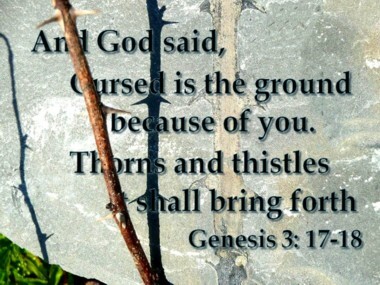 It was only after God cursed the ground as part of His judgement on mans disobedience that thorns and thistles appeared. 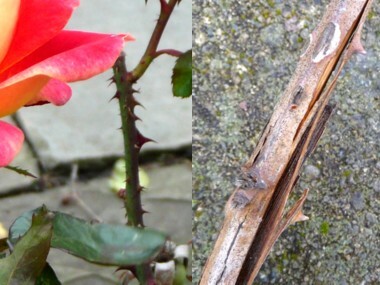 How could non-thorny plants turn into plants with thorns? Evolutionary theory says that thorns evolved as added features to deter animals that eat plants. However, thorns and spines are provably plant structures that do not fully develop into branches or leaves, or result from loss of branches or leaves, i.e. 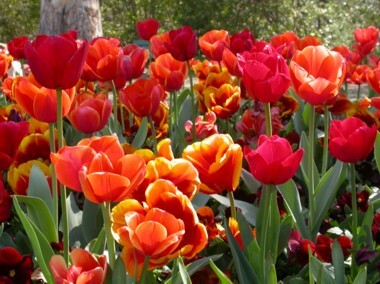 they are a defect in growth of the plant. This is degeneration, not evolution. We get a clue as to how some thorny structures form from this groundcover plant named Selaginella, sometimes referred to as spike moss. 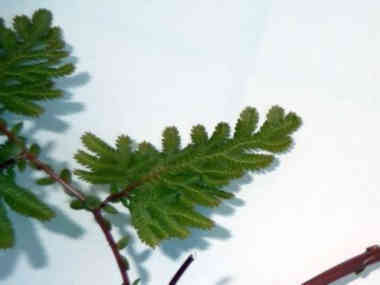 When the plant is growing in moist conditions Selaginella stems are covered with small leaf-like scales called microphylls. In the original very good world, the earth was watered each day by a rising mist. Plants like Selaginella would have remained soft and green. After God cursed the ground the plants and environment began to go downhill. Many of todays thorns and spines are formed by degenerate failure of growth or loss after growth, which is totally consistent with Genesis. Following Noahs flood the environment degenerated more drastically, and earth is no longer moist all the time. Plants easily dry up leaving the hard support tissue to form spiky structures. Whatever processes brought thorns, spines and prickles into being, their formation involves change, but this change is not evolution. It is good evidence that plants, and the environment they grow in, have degenerated � just as described in Genesis. This is where our new fossil finds are a thorny problem. 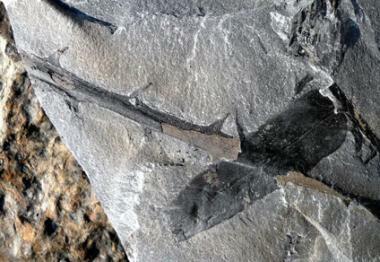 The fossil thorns were found in a layer of Carboniferous rocks. 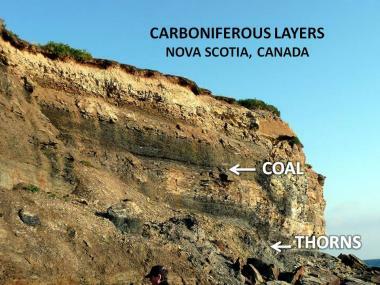 Above this layer in the same region in Canada are rocks containing dinosaur fossils. 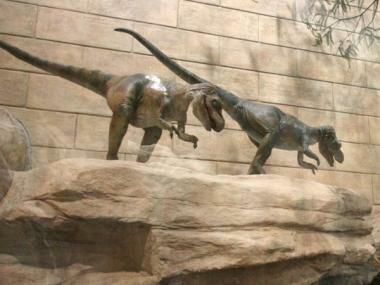 According to evolution dinosaurs evolved and died out long before man appeared on the earth. According to the Bible thorns did not occur anywhere on earth until after the Fall of Man. This would mean our fossil thorns were not buried until after the Fall of Man. Furthermore, if dinosaurs are found in a layer above the thorns then Dinosaurs also did not get buried until after Adam sinned. 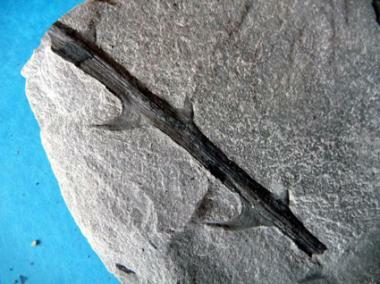 Therefore, finding fossil thorns below fossil dinosaurs is indirect evidence that man and dinosaurs lived on earth at the same time. 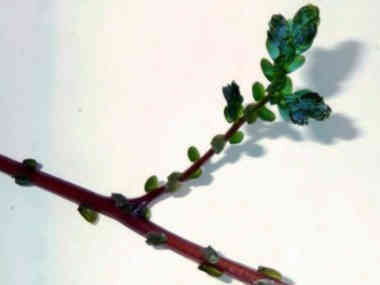 Evolutionary theory says land plants with thorns evolved from seaweed, which evolved from single cells, which evolved from chemicals. Since no-one was there to observe this process and record it, it must conceded this is a belief by blind faith. The Bible says God created fully formed functioning plants in separate kinds. After the Fall of Man plants degenerated. Belief in the Bible is also faith, but it is faith in the record left by God who was there, not in the theories of men, such as Charles Darwin, who were not there.